Surprisingly, I haven’t covered Sgt. Savage too much in the nearly three year history of the site. In fact, this is the first representative of the line’s regularly scaled toys that I’ve written about. There were as many differences as similarities between this attempted relaunch of the brand and the classic small scaled GI Joe figures. The Savage line’s figures have been scaled up a bit, yet retain some of the previous period’s construction style. GI Joe lost articulation with the move away from the o-ring, and the substitute for the old t-hook in the hips doesn’t hold up in terms of poseability. The arms are, for the most part, a progression of the RAH builds. The larger format does allow for a bit more detail in sculpting, and the Sarge has some well defined arm muscles and even more detailed hands. Unfortunately the hands’ construction is just different enough that, while more realistic, don’t seem to hold weapons as well as the older Joes, and in this figure’s case, he can’t hold his rifle in any kind of firing position. Desert Camo Sgt. Savage continued the long history of exclusive mail-in figures that began in the 1980s. But wait a minute, I hear you say. Sgt. Savage had a mail-in figure? Didn’t that line tank faster than Hudson Hawk? Yes, dear reader, it did. 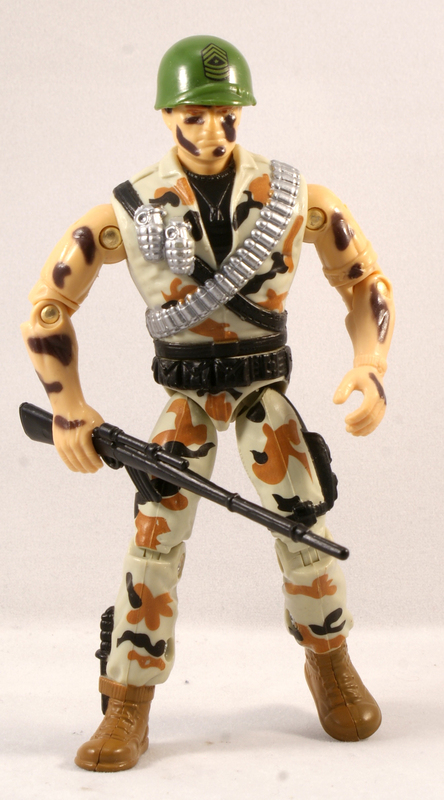 Someone at Hasbro, at the outset, apparently must have had high hopes for the Sarge as a follow-up to the defunct Real American Hero series. The line certainly had its share of care given to its packaging and presentation, if not its marketing. Even the 1995 pre-Toy Fair catalog from Hasbro put Sgt. Savage front and center, with an impressive wrap around cover. After that auspicious debut, things just fizzled. Following on from the last few years’ propensity for gimmickry, Desert Camo Sgt. Savage features color changing paint. Dip him in warm water and the dark camo paint on his face and arms fades to a lighter shade. I would have preferred it the other way ’round, although the dark spots do fit in nicely against his uniform. Nevertheless, it’s a fun little gimmick, and an interesting figure.I also never mind a Joe repainted in tan. I got this complete in a trade once. Wow, I had no idea about the color-changing feature! Also, if you want to give this guy the helmet he actually came with, Jason’s Joes and More has it in their accessory section. By the way–the armband and wristwatch are unpainted, believe it or not. Poor sergeant savage. It was such a half hearted attempt. Also i think power rangers being at its zenith also contributed to his downfall. Oh has anyone else seen the lone sergeant savage episod? He was running around on the Rhine with a minigun. Nothing against Sgt. Savage, but I never had any interest in the line. 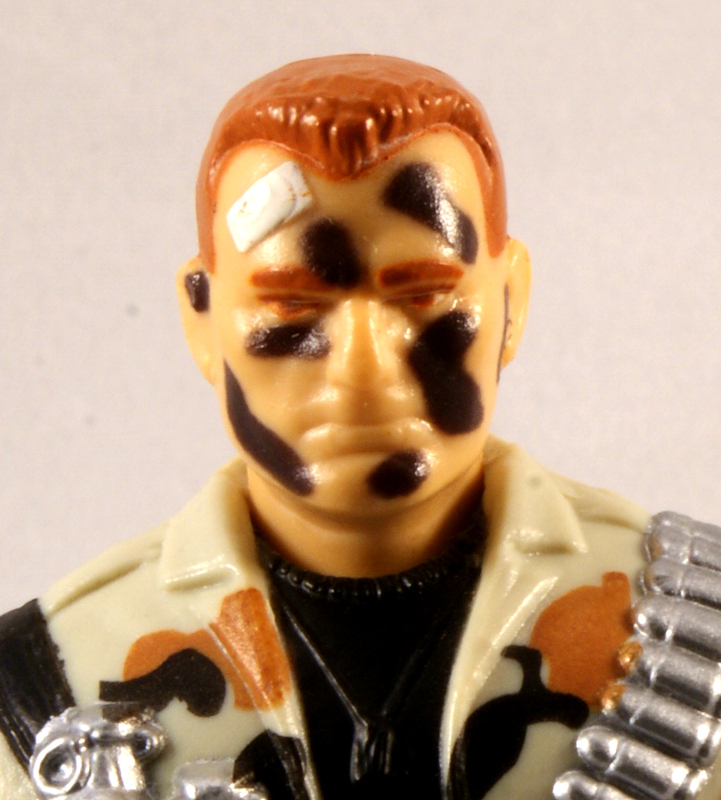 I was into the Real American Hero line and was disappointed when they decided to cancel it and start an entirely new Joe line. I don’t mean to be down on Savage here, but honestly, he almost looks like some of the knock-offs you’ve reviewed here and not an actual Hasbro product. That’s a shame because I kind of like the idea (I’ve always liked DC’s Sgt. Rock and Marvel’s old-school Howling Commandos), but man does the execution seem lacking to me. I still have the basic green version of this figure. He’s even taller than the new 4″ Joes! Didn’t Hasbro tie this line in with ARAH by going the suspended animation route? There was a pilot episode of Sergeant Savage made in which the story goes that at the tail end of the war in Europe, Savage was frozen by a Nazi super scientist [the most evil of that cliche] and he was burried until Lady Jaye [now a blonde] and her team found him in 1994. Savage is then revived and given a unit of trouble makers to streighten out; they become the Screaming eagles. Cameos of note in that episode include Franklin Delanore Roosevelt, Lady Jaye and Hawk [based on the Battlecorps figure of Flag]. Cobra commander also appears [supposedly the last time Chris Latta voiced him] and it is revealed Cobra commander got his funds from General Blitz. It wasn’t Latta, he was deceased by then. It was an imitator. Arguably, Doc also appears in the cartoon, as there’s a black male military doctor wearing glasses called “Doc”, IIRC. The line would’ve been great in 3 3/4″ scale. I recall hearing that as it was it was not planned as a replacement originally, but a sideline. 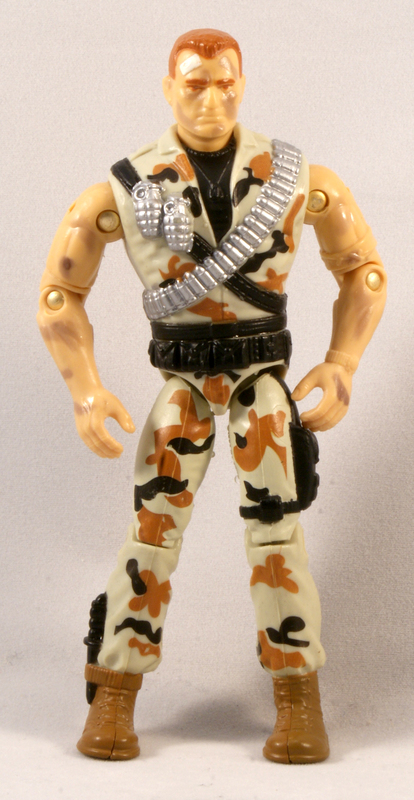 Once they decided to hand boy’s toys development to the Kenner team, SGT. SAVAGE was done, even if it had it been a success. The prototypes for unmade Sgt. Savage figures looked like Kenner creations, IIRC. With the slightly larger stature and generic military look, you could army build this guy as a cyborg army from the future that GIJoe has to defeat. Or just leave Savage in the history books. That cartoon introducing the line does say that the Screaming Eagles are a unit of the G.I. Joe team. Also, don’t forget that Sgt. Savage later appeared in G.I. Joe Extreme, retaining his cryo-frozen back story. So, you could consider Sunbow, DIC, Sgt. Savage, and Extreme to be all one universe. The best part about the Sgt. Savage toys may have been all the artwork from Joe Kubert. Though, that cartoon wasn’t too bad. I can’t stand the Incredible Hulk character designs in it, but the story itself is okay.